The common names of plants will, presumably, always be with us in some form or other, because they are easier to relate to and roll off the tongue better than the corresponding scientific names of plants. In an informal setting, who would be pedantic enough to prefer Cerastium tomentosum as a handle to the much more romantic "snow-in-summer"? 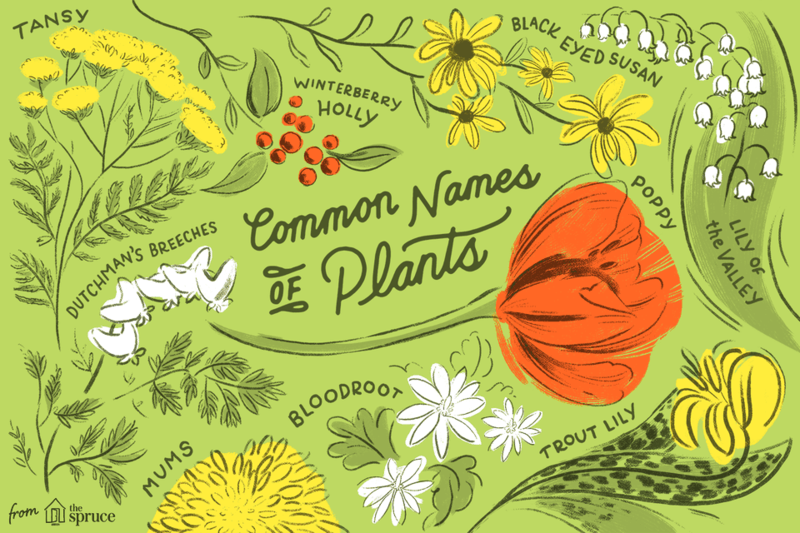 In fact, some botanical names are downright ugly. "Pincushion" flower may not be the loveliest of monikers, but it sure beats Scabiosa, which sounds like a medical condition. Not that we do not occasionally encounter a role reversal. The common name of the plant, Coreopsis is "tickseed." While the former is reasonably melodious (and innocuous-sounding if you do not recognize the Greek root), the latter would evoke rather disturbing images for someone who lives in the vicinity of the Lyme disease capital of the world, Lyme, Connecticut (United States). A bite from a deer tick can land you in the hospital with Lyme disease or other dreaded illnesses, including anaplasmosis. The common names of plants may not be as highfalutin as their botanical counterparts, but they are not altogether lacking in scholarly interest, as many have fascinating historical tales to tell. The following lists provide indices to articles on plants, organized alphabetically, by common plant name (note that in some cases, the scientific names of plants are so commonly used as to function essentially as alternative common names, in which case they are included in this database). Kiwi vines bear tricolored spring foliage: green, a striking pink, and the frosty white that suggested the cultivar name. While Kiwi's contribution comes mainly in spring, Boston ivy is an autumn standout, as its leaves turn shades of red. Bittersweet is another star of the fall. North Americans should grow American bittersweet, because the Oriental version is horribly invasive. The berry borne on the vine in fall is a classic (especially among lovers of crafts), with its peeling, golden husks revealing an orange gem inside. Blue Rug Juniper is a low-growing, viny shrub that is very useful for controlling erosion on slopes. Meanwhile, Bougainvillea is a plant for warmer climates. But Northerners can grow it in containers during the summer, perhaps hung along a patio wall to invoke the Mediterranean. Arrowwood is just one of a number of "triple threat" viburnum shrubs, offering spring flowers, pleasing autumn foliage, and colorful fall berries. Beautyberry takes the art of fall berries a step further, bearing fruit in the rather unusual color of purple (not a bluish purple, but a bright, almost fake-looking purple, such as you might find for a grape-flavored bubble gum). Bluebeard blooms late, just when our landscaping can use the extra color. Another common name for this shrub is "blue mist," because the flowers have a fuzzy appearance. Even without these features, the plant would be valued for the many blue flowers it yields (blue being a highly valued floral color). Adonis stands out as one of the first plants to bloom in spring. Bleeding heart comes along a bit later but is well worth waiting for. Its uniquely shaped blossoms are dazzling enough to inspire poetry. Yellow alyssum will light up any rock garden with its numerous clusters of cheerful, yellow flowers. Italian bugloss is a short-lived novelty: Probably no one else in your neighborhood will be growing this unusual perennial. Standouts from each of the four seasons are represented on this list. Columbine bears unusually-shaped flowers in late spring (the bird-like shape of its blooms suggested this perennial's common plant name, which is a reference to the dove). Crocus is one of the earliest flowers to bloom in spring, winning it a special place in the hearts of many gardeners. Daffodils often take over as "keepers of the color" in spring just after the crocuses have petered out. Meanwhile, Dutchman's breeches is a spring ephemeral and related to bleeding heart. Creeping phlox is at its best when carpeting slopes with its flowers in spring (displaying it on a slope, as opposed to on flat land, allows for better appreciation of its blooms). Trees and shrubs are also among the spring favorites on this list. Daphne shrubs and cherry trees both provide the landscape with wonderful floral color in spring. Carol Mackie daphne has a fantastic fragrance. Roses are stars of the summertime, and landscape roses such as Candy Oh! are among the easiest to care for. Like Dutchman's breeches, Dutchman's pipe furnishes some "flavor of Holland." It is a vine plant that is used for shading and screening during the summer. Montauk daisy and autumn clematis bloom late, offering your yard floral color in fall. Rockspray cotoneaster is an example of a deciduous shrub that can function as a ground cover; it bristles with bright red berries in fall. And, of course, who would be caught without the magnificent floral displays of the chrysanthemums in autumn? Meanwhile, the shrub-form dogwoods (both those with red bark and those with yellow bark) are winter standouts. Some plants on this list do double duty (or even more). For example, doublefile viburnum sports both spring flowers and fall foliage, as do the tree-form dogwoods. Golden Shadows pagoda dogwood has all of the other dogwoods beat when it comes to offering multi-season interest. This small tree is simply packed with landscaping gifts, in the form of features that will delight the homeowner at different times of the year. It provides winter interest with its branching pattern, as well as spring flowers, as you would expect from a dogwood. But it also boasts terrific spring foliage and good fall foliage. Elephant ears, flowering onion (Schubert's), and corkscrew filbert are some of the interesting listings in the E-F section. Elephant ears are better known in some parts of the globe, where it is eaten, as "taro." But "elephant ears" makes perfect sense to those of us who grow it for its ornamental value, which derives from the enormous leaves. Schubert's flowering onion is an allium that delivers a fireworks display to your landscaping. Corkscrew filbert is just one colorful common name used to refer to a shrub whose trunk and branches twist and turn in every which way. Ginkgo, golden chain tree, and witch hazel are three of the more intriguing entries here. Ginkgo, considered one of the oldest trees in the world, is a specimen covered with little hand fans for leaves. With golden chain trees, it's not about the foliage at all, but rather the namesake "chains," which are racemes of flowers. You may be more familiar with witch hazel as an astringent liquid you buy in a bottle, but its source is the shrub, witch hazel. Did you know that Boston ivy is related to Virginia creeper? Hetz holly has fooled many a gardener into thinking it's a boxwood; learn how to identify this type of Japanese holly here. And so-called "Japanese rose" is not a rose at all, but that won't trouble you as you admire its golden, button-style flowers. "Korean spice" viburnum is not a culinary reference but refers, rather, to the smell of this shrub's flowers. Lantana is widely grown, but don't lapse into a fall sense of security with it if you have small children: Lantana is toxic. "Lenten" rose is so called because of the time of year it blooms in certain locales; it is not really a rose. Maltese cross, mistletoe, and Narcissus all have a rich history behind them. In the case of Maltese cross, that history is mainly medieval. Mistletoe and Narcissus have deeper historical roots. The former was considered magical by ancient peoples such as the Druids, while the latter's name derives from the same Greek myth that gives us the word "narcissism." Oakleaf hydrangea is a shrub that truly furnishes year-round interest, as it provides visual interest in your landscaping for each of the four seasons. "Oswego tea" doubles with "bee balm" as a common name for the plant, Monarda didyma. Why the need for the alternate name? Well, each name reflects a use for the plant, one culinary, the other medicinal. Poinsettias can make you sick if you are allergic to latex. You may think of jelly when you hear "quince," but the jelly you buy at the supermarket comes from a different plant (Cydonia oblonga) than the one grown in North American landscapes (Chaenomeles speciosa). The older kinds of flowering quince do yield a fruit, and you could make jelly from it, but it's not worth the effort. Gardeners in North America are used to treating red salvia as an annual, but this tender plant is a perennial in its native Brazil. Finally, "reticulated" iris is so called because its bulbs bear a pattern that looks like netting (reticulata means "netted" in Latin). Did you ever wonder why so many common names of plants end in "wort," such as St. Johnswort? The fact is, "wort" comes from the Old English word for "plant" and is used as a suffix for some of our oldest common plant names (especially the names for plants with medicinal uses). "Shamrocks" refers more to an idea than to a specific plant. Did you know that tansy, an herb used traditionally to repel ants, is toxic? Some of the plants listed below are strongly associated with particular times of the year. 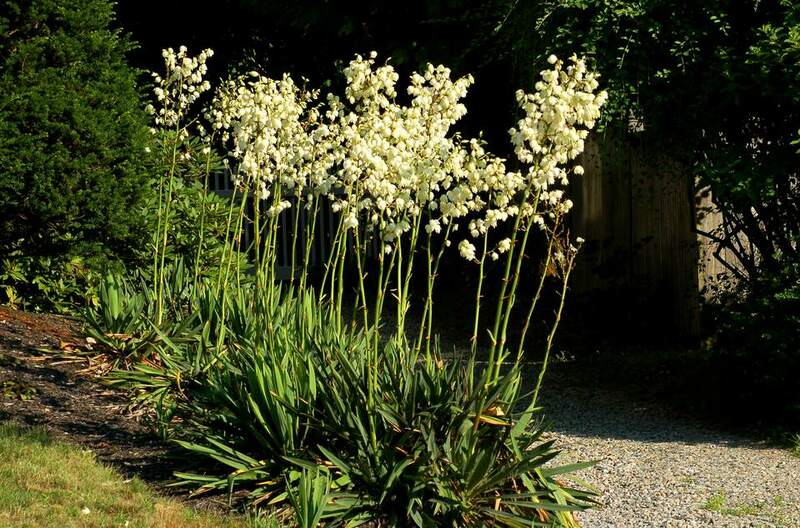 For example, sweet vernal is a wonderful spring plant (indeed, "vernal" means "pertaining to spring"). Victoria blue salvia is treated as an annual in the North and furnishes your landscaping with an exquisite blue color all summer. Winterberry's peak display period in zone 5 is around the Thanksgiving holiday (U.S.). And yews boast a longstanding association with Christmas. Which Plant Names Will Drive You Crazy? What Is Friable Soil and Why Do Gardeners Crave It so Much?